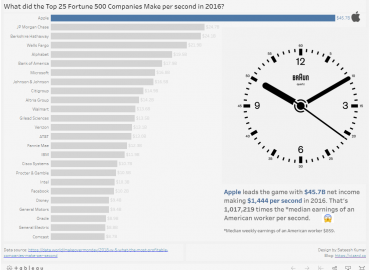 Archive by Category "Viz Gallery"
What did the Top 25 Fortune 500 Companies Make per second in 2016? Apple leads the game with$45.7B net income making $1,444 per second in 2016. That’s 1,017,219 times the *median earnings of an American worker per second. *Median weekly earnings of an American worker $859.